Background: Even though, it is said that adhesive capsulitis is a self-limiting condition, many subjects remain with long-term sequelae. Codman's paradox is commonly used in manipulation under anesthesia technique for adhesive capsulitis of shoulder, which composes of a specific pattern of motion at the shoulder joint leading to an indirect humeral rotation without placing a rotational torque on the humerus. In this case study, Codman's paradox movement was modified and performed within pain tolerable range and without anesthesia in a subject with adhesive capsulitis. Aim and Objective: This case study analyses the effect of modified Codman's paradox movement in a 50-year-old male diagnosed with symptoms of adhesive capsulitis for more than 6 months. Materials and Methods: A single case study design was used. The study duration was 4 weeks. Baseline and posttest outcomes measures of shoulder range of motion (ROM) (flexion, extension, abduction, external rotation, and internal rotation) were measured using a universal goniometer and Shoulder Pain and Disability Index (SPADI) questionnaire. Results: Posttest measures of numerical pain rating scale, shoulder ROM and SPADI showed improvement, proving that modified Codman's paradox is effective in adhesive capsulitis. Conclusion: This study result concludes that modified Codman's paradox is effective in improving shoulder ROM among subjects with adhesive capsulitis. خلفية الدراسة: على الرغم من انه يقال إن التهاب المحفظة اللاصق هو حالة ذاتية الحد، فإن العديد من الحالات المرضية تبقى معها مضاعفات على المدى الطويل. وتستخدم مفارقة "كودمان" بشكل شائع في المعالجة تحت التخدير للالتهاب المحفظة اللاصق للكتف، وذلك من نمط محدد من الحركة عند مفصل الكتف مما يؤدي إلى تناوب عضدي غير مباشر دون احداث حراك دوراني على عظم العضد. في هذه الدراسة، تم تعديل حركة "كودمان" المتناقضة وتم تنفيذها ضمن نطاق من الالم يمكن تحمله وبدون تخدير في موضع التهاب المحفظة اللاصق. الهدف والهدف: فى الدراسة الحالية يتم تحليل تأثير حركة مفارقات "كودمان" المعدلة في مريض ذكر يبلغ من العمر 50 عامًا تم تشخيصه بأعراض التهاب المحفظة اللاصق لأكثر من 6 أشهر. المواد والطرق: تم استخدام تصميم دراسة حالة واحدة وكانت مدة الدراسة اربعة أسابيع. وتم اجراء قياسات خط الأساس ونتائج ما بعد الاختبار من نطاق الكتف للحركة (ROM) (الثني، والمد، والاختطاف، والدوران الخارجي، والدوران الداخلي) باستخدام مقياس لمقياس goniometer العالمي ومؤشر ألم الكتف والإعاقة (SPADI). النتائج: أظهرت مقاييس Posttest لمقياس تصنيف الألم العددي، والكتف ROM وال SPADI تحسنا، مما يثبت أن مفارقة "كودمان" المعدلة فعالة في معالجة التهاب المحفظة اللاصق. الاستنتاج: نتيجة هذه الدراسة خلصت إلى أن مفارقة “كودمان" المعدلة فعالة في تحسين ROM الكتف بين الأشخاص الذين يعانون من التهاب المحفظة اللاصق. The shoulder is the site of many painful conditions. The shoulder is a unique anatomical structure with an extraordinary range of motion (ROM) that allows us to interact with our environment. Adhesive capsulitis is reported to affect 2%–5% of the general population and has been reported in 19% of type II diabetes subjects. Adhesive capsulitis hinders the function of shoulder which is crucial in many activities of daily living. It has been described as having three sequential phases: a painful stage, a freezing stage, and a thawing or recovery stage. Pain and limited ROM can occur in all phases of adhesive capsulitis, which often does not follow a stepwise course. Pain and decreased ROM can persist for one to 2 years,, and up to 10% of patients never recover full ROM. The diagnosis is usually clinical, although imaging can help rule out other conditions. Several treatment options are commonly used, but few have high-level evidence to support them. Many treatment options for adhesive capsulitis have been described in the literature. One of the main goals of all the treatment is to restore shoulder function. Manipulation under anesthesia is considered as the last option in conservative management. It must be emphasized that even after manipulation under anesthesia, a regular supervised physiotherapy is critical to ensure a mobile painless shoulder otherwise significant stiffness quickly returns. Codman's manipulation is the technique widely used during manipulation under anesthesia. Codman's manipulation includes three consecutive 90° rotations called elevation, swing and descending movements. These movements lead to the indirect humeral rotation without placing a rotational torque on the humerus, thereby reducing fracture risk during manipulation. However, there is lack of evidence of the effectiveness of simulating Codman's paradox movement without anesthesia among subjects with Adhesive capsulitis. This case study aims to investigate the effectiveness of modified Codman's paradox movement in a subject with adhesive capsulitis. A 50-year-old man Mr. Settu presented to the physiotherapy department with a history of pain and stiffness in the right shoulder for the past 6 months. He was a ward assistant in a hospital by profession. He complains of pain that was aggravated by any activities that require overhead arm movement. Initially, he had pain and stiffness at end ranges in overhead activities and gradually stiffness and pain has worsened. At present, he was unable to lift his arm above shoulder level. He was a known case of type II diabetes mellitus for the past 7 years and on medications (ORAL HYPOGLYCAEMIC AGENTS). For the present complaint of the right shoulder pain, he sought private orthopedician's opinion 3 months ago, X-ray and laboratory investigations (thyroid function tests) were done and found to be normal without any abnormalities. He was managed with analgesics and referred to a local physiotherapy clinic to undergo wax bath for 10 days followed by shoulder exercises. The pain was relieved by 30% during the medication period and recurred once stopping the drugs. He regularly does shoulder pendular swinging, wall ladder exercise and active assisted shoulder ROM in all planes. On examination, he had no history of trauma inciting this present complaint. No history of radiating pain and no other joint pain or stiffness. He had no history of previous inpatient hospitalizations. Mr. Settu had an endomorphic built with protracted shoulders. On examination, both shoulder were at same levels, no swelling, or redness. On palpation, mild tenderness of grade II present around the joint line. ROM was measured using universal goniometer, and it restricted up to 95° of shoulder flexion, 80° of abduction, 15° of external rotation, and 60° of internal rotation (tested in arm parallel to trunk). Right scapular motion was restricted in upward rotation. Left non affected shoulder and scapula motion was normal. Passive accessory movements of glenohumeral posterior, inferior and lateral glides were restricted. There is no distal neurovascular deficits. The pain was aggravated by any attempt to do overhead activities and relieved by rest, hot packs, or medications. 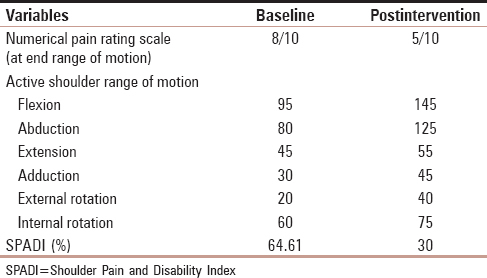 In numeric pain rating scale, pain at end ranges in all planes was 8/10. His ADL assessment revealed that he had difficulty while bathing (inability to reach a hand behind back or neck), wearing T-shirt, donning a belt, combing, tucking the shirt, etc. Mr. Settu was advised to continue using his right upper extremity with his customary activities of daily living. A single case study (A-B-A) design was used. The study protocol is divided into three phases. The first phase consists of baseline assessment of the right shoulder measured using numerical pain rating scale, shoulder ROMs (flexion, abduction, extension, external rotation, and internal rotation) and shoulder pain and disability index (SPADI). The second phase is the intervention phase in which, modified Codman's paradox movement was used. In this method, Mr. Settu was positioned in supine lying in a treatment couch with adequate exposure of the right shoulder. He was advised to completely relax his shoulder during the intervention. His upper limb was positioned parallel to trunk with palm facing medically and thumb pointing anteriorly, his arm was elevated passively up to pain tolerable ROM in the plane of flexion and when the pain reaches maximum tolerable, the arm is abducted and descended to place parallel to trunk with palm facing outward and thumb pointing posteriorly. This movement pattern was repeated for 5 times per se t, 3 sets in a session, and 5 sessions in a week. The intervention was provided for 2 weeks. Hot pack fermentation provided to the shoulder before and after the intervention. Third phase is the post-intervention phase. Post-intervention measures of numerical pain rating scale, shoulder ROMs (flexion, abduction, extension, external rotation, and internal rotation), and SPADI were recorded. Mr. Settu had improved ROM with a slight reduction in pain. Numerical pain rating score was 5/10 after 2 weeks of intervention. Flexion, abduction and external rotation have improved with the intervention. SPADI was improved from 64.61% (baseline) to 30% in the postintervention period [Table 1]. This case study proves that modified Codman's paradox movement pattern is effective in improving outcomes among subjects with adhesive capsulitis. This case study was designed to determine the use of modified Codman's paradox movement in improving shoulder ROM, function and pain over 2 weeks' period. The result of this case study supports modified Codman's paradox movement in improving shoulder ROM in adhesive capsulitis. Many physiotherapy techniques have been employed in the management of shoulder disorders; few have been proven to be effective. Efficacy of a technique is based on the success criteria. Codman's paradox refers to a specific pattern of motion at the shoulder joint. If the arm performs three consecutive rotations that result in a closed loop motion of the arms end, its axial rotation will be different from the axial rotation in the original posture. This case study validates the use of modified Codman's paradox movement in adhesive capsulitis. Modified Codman's paradox movement performed in this case study in an effort to increase shoulder joint mobility in adhesive capsulitis have shown significant improvement in posttreatment period. Further studies in the form of RCT are warranted to compare the therapeutic effects of this movement with other treatment regimens. Simulating Codman's paradox movement (without manipulation under anesthesia) in conservative management of adhesive capsulitis is a new concept and not reported in the literature. The authors would like to acknowledge their gratitude to and Dr. Clement joseph (MS Ortho) full fledge to complete this study. We are thankful to all the therapist and referral physicians of Global hospitals and health city for their support. We also wish to express our gratitude for our family members and friends. Manske RC, Prohaska D. Diagnosis and management of adhesive capsulitis. Curr Rev Musculoskelet Med 2008;1:180-9. Hariharasudhan R, Balamurugan J. Effect of proprioceptive neuromuscular facilitation stretch and muscle energy technique in the management of adhesive capsulitis of the shoulder. Saudi J Sports Med 2015;15:170-5. Balamurugan J, Venkatraj R, Anantharaja P, Nagaraj S, Preethi S. Total end range time and Maitland's antero-posterior glide mobilization in frozen shoulder of type II diabetic subjects. Int J Pharm Ind Res 2012;2:366-70. Gupta S, Raja K, Manikandan N. Impact of adhesive capsulitis on quality of life in elderly subjects with diabetes: A cross sectional study. Int J Diabetes Dev Ctries 2008;28:125-9. Hand C, Clipsham K, Rees JL, Carr AJ. Long-term outcome of frozen shoulder. J Shoulder Elbow Surg 2008;17:231-6. Tveitå EK, Sandvik L, Ekeberg OM, Juel NG, Bautz-Holter E. Factor structure of the shoulder pain and disability index in patients with adhesive capsulitis. BMC Musculoskelet Disord 2008;9:103. Anthony E. Adhesive capsulitis: A review. Am Fam Physician 2011;83:417-22. El Badawy, Fathalla MM. Suprascapular nerve block followed by Codman's manipulation and home exercises an effective combined approach in the rehabilitation of idiopathic frozen shoulder: A review. Lupus Open Access 2016;1:108. Cheng PL. Simulation of Codman's paradox reveals a general law of motion. J Biomech 2006;39:1201-7.